Hi folks! My apologies for the quiet streak- it’s been busy here at the Coop! First and foremost, many thanks to those who have been coming by to pick up our recycling! We always appreciate the help. Next, I want to let you all know that Rachel has shut down her Cool Beans Café at the Coop to move on to other adventures. Keep an eye out for her in town! She is moving on to some exciting things, but we’ll miss her. In the meantime, the space is remaining empty. If any members want to weigh in on what you feel like you’d like to see the space used for in the Coop, let us know! We have many ideas brewing but we love to hear the input from our members. Other news this week: Turkeys! Can you believe it’s almost time to get ready for Thanksgiving?! This year we have a wonderful organic, free range option available for pre-order. Turkey orders must be in by October 28th so please call or drop by the Coop if you would like to place an order. We also have a new bulk ordering system in place for members to order bulk items! There is a binder set up at the clerking counter. Members can sign up to purchase increments of bulk items up to the shipping amount, and once that amount is reached we will order the bulk product in for everyone. Right now we have staples like beans, rice, salt, oats, cashews and more. Once we get more suggestions and orders in, the list will grow! And now the moment you’ve been waiting for: the Fresh list! The “word of the week” is Squash! 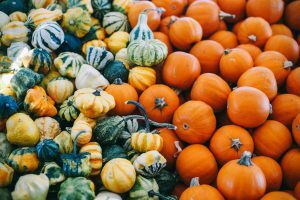 We have such an amazing variety of fall and winter squash here for you. Sugar Pie Pumpkins from Hopewell Farms, WA and beautiful white “Cream of the Crop” Acorns from Willowood Farms, Ebey’s Prairie WA. Very tasty Acorns, Butternut, Futsu, Delicata and Hubbard squashes from Moondance Farm, Acme WA. From Frog Song Farms, Skagit Valley WA we are carrying a small variety of very cool veggies this week! Edamame (so fuzzy, so fresh! ), European Pears, and Burdock root (try it in a salad or just eat a few crisp fresh slices). Other veggies this week from Moondance Farm include sunflower sprouts, salad greens, carrots, Bullhorn peppers, onions, kohlrabi, eggplant, cauliflower, and turnips. us leeks, rutabaga, collard greens, and of course their wonderful varieties of satina, purple, and red potatoes! On top of all that, we have green cabbage from Ralph’s Greenhouse, Beefsteak tomatoes from Hedlin Farms, Zucchini from Carbrera Farms, Grapes and Apples from Gaia Rising Farms, and Broccoli from Hopewell Farms. Oh my! That’s all for now- hope to see you soon at the Coop!